This year I started a Business. “Big deal” you say; hundreds, nay thousands of new business get started each year in this country, yet only a few ever make it past the “getting started” stage. According to AngelList platform, which helps start-ups raise money from investors and recruit talent, there were 17,621 start-up companies in the US in 2016. Forbes reports that of those, 90% will fail. That’s not only heart-breaking, it’s downright depressing, when you think about all the time, money, energy and plain elbow grease which were expended by people who had ideas and dreams which took off with great fanfare, but in short order crashed to the ground like so many airplanes shot out of the sky in old WWII newsreels. How’m I doing? I’m struggling, but I’m not giving up yet. See, I spent the last 8 years of my life working in a job that I became really comfortable in and passionate about. I even invested myself into areas I would never have dreamed of a few years earlier, just so I could be the best at my job, because I thought I’d retire from that job in another 20 years. Then, things changed. Oh, I didn’t leave that job; the job left me. Not only that, it did me the disservice of not really providing me with a specific reason for being let go, when clearly just days before I got “the call”, I was praised by my supervisor for a job well done – repeatedly – and was even sent to a conference of peers in my industry to become even better at what I was doing. And then it was no more. After scrambling through the holidays of 2016 to find some substantive work, I wrestled with finding a way to continue doing work that I enjoyed, harnessing the tools I developed in Association Management as a membership coordinator when a peer suggested I should just go into business as an independent contractor using all I’d learned at my last job to help multiple organizations in areas where they were needing to fill a void, to make their organization better, to reach their clients or members or customers more effectively. So I started Associated Project Management, and began marketing myself and my services to various organization and individuals in an effort to work at the work I enjoy, while helping others meet the vision of their work. My friend Mo Bunnell, who founded the Bunnell Idea Group (BIG) in Atlanta, recently shared an article on doing our best work, which inspired me at a time when I was beginning to think I had bitten off more than I could chew with independent contracting. What matters the most? Doing work that we can be proud of. Trying our hardest. That’s what matters. Doing our best work is one of the hardest things in life we must do. It’s a constant struggle to do our best work. Life has a way of pulling us from it. Once I was about to make a bad move on one of the most important projects of my life. As our team was starting work on our book proposal, we got connected to Amy Hiett, the COO of a company called The Table Group. If you haven’t heard of them, they’re the consulting and training arm of best-selling author Patrick Lencioni and his organizational health concepts. They do exceptional work. We felt fortunate that Amy would take our call. My colleague Darla and I prepared as you’d expect, using our GrowBIG® Dynamic Meeting Prep process. Darla and I were ready, called in early, and were excited to learn from Amy when she popped on the bridge line, right on time. I initially thought that was obvious, but after 15 minutes of back and forth, Amy enlightened us. She taught us that trying to write a best-selling book would push us to write a bad book, one that wouldn’t be authentic. Instead, she gave us very strong advice I’ll never forget: Write a book you can be proud of. Before the call with Amy, we were aiming to please people who pick the best-selling lists: people we don’t know using a process few understand. We were more worried about selling and marketing than creating a great product that could enrich lives. Amy’s advice was to write an insightful book based on our unique ideas, our processes, showcasing our clients’ amazing success. Creating something we could be proud of pulled the control back to us. It took away the worry. Oddly, it made the project easier to figure out, and more fun to create. We just had to please ourselves. After we finished the call with Amy, Darla and I called each other to debrief. Wow! That was a trip to the mountain top. That was wisdom. In thirty minutes, Amy changed our entire direction, our entire approach, our entire attitude about writing a book. I now try to consistently apply the lesson we learned from Amy to the rest of my life. I think of three questions: Did I choose to do the most important thing, instead of letting the less important thing choose me? For that task, was I fully present, giving my all into making the product, the interaction, or the experience truly exceptional? Did I do this until the task was completed, ignoring the many distractions of today’s world? We have opportunities to impact people every day. We’re designers of experiences all day long: a client interaction, a hard workout, an end of day review with my wife before dinner. They are worth our attention, focus, and best effort. Mo finished his article by saying that doing your best work is difficult. The world pulls us to the less important. It tries to distract us. And, when it’s over, the world responds with its grade, including many things outside of our control. What was the grade? What did the client think? How many “likes” did we get? Did I do something I can be proud of? My goal is to always do my best work, whether for me, or for you. Let me be that additional team member, the extra player in the game that makes the difference in the outcome, the added cog to the machine that pushes your organization forward. See what I have to offer to you by giving me a call and discussing that area of projects that never seem to get off the ground, or get back-burnered while something more pressing needs completing, yet still needs to be done. It’s what I do. It’s my best work. Bunnell Idea Group (BIG) is a global business development consulting firm. Their trademarked GrowBIG® Integrated System is helping companies grow their business faster, in the right way. Our business development system helps professionals get focused and efficient in business development. Andrew is a very creative person with experience in marketing at his most recent position at IIAG, where his duties encompassed marketing membership services and resources to some 4,300 individual members in 550+ organizations for the association, and marketing for several previous positions and entrepenureal ventures. Through his Independent Business – Association Project Management-APM -Andrew McElhannon can offer your organization assistance in getting these very important projects completed so you can better focus on your members. Please reach out to him to set an appointment to discuss what challenges his business can help you overcome. Association Project Management is changing its name to better identify who we are and what we do, and to reach a broader client base! Beginning soon, we will become Associated Project Management. We still exist to extend your team with a committed, trusted expert who helps to reduce costs, lower risks, improve inefficiencies, meet deadlines, solve challenging problems, support strategic initiatives and produce better outcomes for your staff. And, we still have a heart for Associations of all trades – where our roots are – but, so many other organizations and businesses are reaching out to us for assistance with services and project management, where updating our name to reflect the scope of who we can assist. I recently started two home-based businesses, and one of my first concerns was keeping all my work organized, keeping my client database readily available, and would I be able to bill out all my work timely and accurately without any hiccups? So, I started researching office automation systems and, while there are many excellent choices out there, some were out of my price range for these new start-ups which hadn’t yet generated any substantial income to off-set the operating expenses. Instead, I chose one that had a low annual fee, but would still meet all my needs day-to-day. Then, as I began doing the particular work I had set out to pursue with my businesses I began to find other applications which assisted me in streamlining the work while offering me the technological advances that put me ahead of competitors. They’re all super-easy to use, and several of them are even FREE! So, today I want to share them with you, because so many of you are looking for ways to make your new, entrepreneurial venture the best it can be, without having to be a computer whiz, and without breaking the bank. I love Evernote. Since I discovered it about a year ago, I’ve begun using it extensively in my work, and just for fun too! I use it mostly with my cell phone, because I can dictate writing on the go, and then when I get back to my office, its already synced up on my laptop – I just have to edit it. Best of all – it’s a free download. Expanded levels of service do carry a subscription fee, but at most – $7.99 a month – it’s still paltry compared to other apps. Those are the main reasons / ways many Lifehackers are using Evernote. This is the one that I was telling you about in the beginning. Their positioning statement is: Chaos. Simplified. When you first begin planning your new venture, you will say to yourself more than once “How am I going to do all these tasks completely and consistently – every time?” Well, my friend, 17Hats is the answer for that. Apart from the catchy app name – which obviously comes from the feeling all business owners ultimately have of wearing many hats to get the job done – 17Hats will make you feel and look professional right out of the gate! 17hats is the ridiculously easy, complete system that helps automate, organize, and optimize small business management for freelancers and entrepreneurs. Honestly, it’s not as intuitive to use as I think it should be, but once you get the hang of navigating around the system to do what you need, it’s really quite the bomb! And, they have an excellent Knowledge Base with Tutorial videos, articles, and walk-throughs. Get your Money – Their library of templates helps you customize Professional Invoices, E-signable contracts, Custom proposals, and with bank account or payment processing app (like Square) integration, you can collect money from clients electronically, instead of waiting for the US Postal Snail to deliver their check. Do less Work – Automate project processes, create a library of templates, and generate automatic payment reminders. Keep it Clean – 17Hats offers a client dashboard, allows you to sync multiple email clients and calendars, has Time Tracking* and task lists, and the overview dashboard lets you view your daily priorities at a glance. *The Time Tracking feature is especially handy if you need to get paid by the hour, and keep up with how much time you send on a project, or even individual project segments. You can even print out and attach time reports to itemize your invoices if you need to. Handle Scary Accounting – Super-simple bookkeeping tools, integration with QuickBooks online, Tax reports and P&L statements, and the ability to connect to over 200,000 financial institutions electronically! Stop Worrying – Access your account anytime, anywhere*, have Secure Data Protection, and none of your profile or account information is ever shared with 3rd parties by 17Hats! *Some functionality of some of the features is not available on the phone app, but you can see most everything you’d want to do a “look-over” mobilly, if you wanted to. You’ve probably seen this one advertised on TV. This free* app allows you to take the guesswork out of your mileage logging and reporting. No more scratching down the odometer mileage when you start or finish, or mapping the mileage on Google maps and doing the math – MileIQ does it all. Best of all, it just works in the background from your phone while you drive. No buttons to press to start or stop. Your miles are automatically logged and recorded creating a complete record of all your tax deductible and reimbursable mileage (Yes, you can pause it when you don’t want to record all your mileage). *Basic is Free and gives you logging for up to 40 drives every month – you can upgrade at any time; Two levels of Premium offer monthly or annual billing at a discount – $5.99 or $4.99 respectively, a 20% savings for annual, and unlimited drives are logged monthly; and there’s MileIQ for Teams of drivers featuring a volume discount, single billing, premium support and personalized training. In the last few years the network has undergone some major updates—including the way it helps businesses connect with customers and prospects. 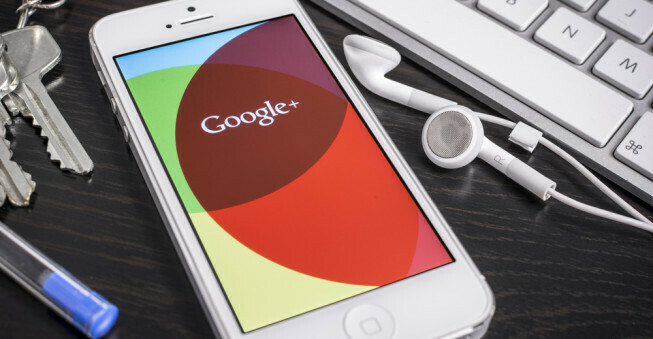 Local search results – Google Plus Pages for businesses are now managed through Google My Business, a platform that makes it easy for customers to find and connect with your company. Influence over potential buyers – Google Plus accounts are no longer required for customers to leave reviews. That means anyone that does business with you can share their experience. You can use business reviews as a way to get more credibility, increase your organic search ranking, and influence potential buyers to check you out over the competition. Resources at your disposal – In addition to Google Plus, you have a ton of other Google resources at your disposal—Communities, YouTube, Gmail, Google Maps, Hangouts, AdWords—all intended to help you maximize your marketing strategy. Community engagement – By strategically organizing your connections on Google Plus, you can segment key audiences and share relevant content. It’s a great opportunity to get +1s, re-shares, and replies. A study conducted by HubSpot showed that sites using the +1 button get 3.5 times more visits on Google Plus. This is a great opportunity for you to join the discussion or get engagement on your own content. Ripl (pronounced “ripple”) is Social Media marketing for small business. 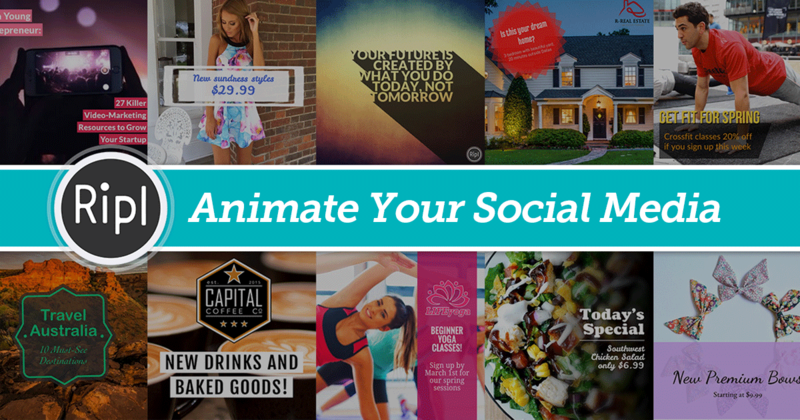 Create eye-catching animated videos that help your business stand out on social media and improve customer awareness. Its FREE (yes, there’s a paid version with more features), and works really well with Facebook. Social media has exploded with businesses and brands posting an ever-increasing amount of new content every day. However, certain kinds of posts work better than others. Research shows that compelling animated video posts provoke the best engagement rate (likes, followers, re-sharing, etc.) and customer response. This leads to more customer loyalty, stronger customer advocacy and more new customers over time. Small business owners also need a compelling brand identity and online customer engagement in order to compete, grow and thrive. Your customers will tell your story best… if you provide them a memorable story to share and make it easy for them to show their love! Ripl is the mobile app designed to help you do just that. The Ripl app is simple, quick and intuitive because business tools should do the work for you, not make more work for you. I LOVE Flyp, because I do independent contract work for clients all over the Southeast, and when I need to have a local phone number (and you do, because you know clients you call at least screen numbers by caller ID before answering, and if it’s not local, it must be a pesky “sales call”, right?) Flyp gives me as many as I need for business – and on the cheap! Flyp gives you the highest quality calling and texting from multiple phone numbers, all from your personal device. No more unreliable Wi-Fi calling. What are you waiting for? Flyp is so-o-o inexpensive – Flyp has simple, modern pricing that we can all understand. Right now, Flyp is offering a 7-day free trial on your first Flyp number, and each Flyp number is only $7.99/month or $79.99/year!! This app makes a great “Wine and Cheese”-type pairing with MileIQ. Especially if you’re on the road a lot with your business. Not only does it turn your phone or tablet into a portable .pdf scanner – great for saving all those meal and hotel receipts – it’s un-promoted feature of saving on Chiropractic bills as well is a life saver! : No more riding mile after mile on a wallet full of receipts – Guys, you know what I’m talkin’ about. ‘Nuff said. One of the most impressive Free apps out there today, Prezi (short for Presentation) takes PowerPoint to the next level with cool animation and easy shareability. The presentation software uses motion, zoom, and spatial relationships to bring your ideas to life and make you a great presenter. Customizable templates let you create dynamic, individualized presentations. You put in your text and images and then choose a color scheme, theme and filters. Prezi is free if you don’t mind sharing your presentations with its online community or $5 a month if you want to keep them private. Hootsuite is a Social Media Marketing & Management Dashboard, allowing you to Manage all your social media in one place. From finding prospects to serving customers, Hootsuite helps you do more with your social media. The basic Premise is this: Save time by managing all of your social media marketing efforts from a single dashboard. With Hootsuite’s platform, you get the tools to manage all your social profiles and automatically find and schedule effective social content. Features include Scheduling of Social Media Posts, Content Curation, Analytics, Monitoring, Team Management, Contests, Security of your brand, and Apps and Integrations with over 250 best-of-breed technology partners in the Social Media ecosystem. Plans start Free for 1 user with 3 social profiles (i.e.- Facebook, Twitter, LinkedIn), and go up from $19 a-month for 1 user with 10 social profiles to customized pricing after breaching the Team ($99 mo. – 3/20) or Business ($499 mo. – 5-10/50) levels. Guys and Gals – if you’re doing Social Media marketing on any level for your entrepreneurial, new or existing business – You need to be using Hootsuite. Period. In addition to Hootsuite, you’ve probably heard of MailChimp but don’t know anything about it. MailChimp is relatively new to me as well, as far as actually using it, but I am rapidly growing to love what this application does for one of my businesses – and does it for Free! If you’ve been looking for Automation Software to do email marketing for your business – almost hands-free after setup – and you just can’t bring yourself to stroke a 4-digit check for Infusionsoft, then MailChimp (or another of your choosing) is for you. Don’t get me wrong – Infusionsoft may be just what you’re looking for in your business, especially if you have more than 2,500 contacts and you send more than 12,500 emails (That’s 5 emails per contact, not individual emails) each month to market to them. I’m not there yet. If you need a system that does that for you, then I’d suggest you do your research – and start here. It’s as good a place as any I’ve seen. Here’s why I chose MailChimp: It does the functions I want it to do for me in my email marketing / client follow-up processes, and I’m using the Free version to accomplish that, plus I ordered this step-by-step setup guidebook on Amazon for $10. That’s it, basically. The other thing I like about it, is it’s expandable – or, scalable – a new term I picked up this year – meaning it grows with my business with other features it already has that I may not be using yet. MailChimp provides marketing automation for e-commerce businesses. It allows you to send beautiful emails on an automated schedule, if you like, connect your e-commerce store, advertise, and build your brand. Millions of people and businesses around the world use MailChimp, which has been around since 2001. The company started as a side project funded by various web-development jobs. Now they’re the world’s leading marketing automation platform, and they send more than a billion emails a day. They democratize technology for small businesses, creating innovative products that empower their customers – you and I – to grow. MailChimp’s robust marketing automation makes sure your emails get to the right people at the right time. Target customers based on behavior, preferences, and previous sales. Trigger a series of emails with a single API (if “this”, then “that”) request. Use the built-in segmentation to build custom rules. Delight your fans with a free gift. And when you’re finished, get in-depth reporting insights to make every automated series you send better than the last. Marketing automation is like a second brain for your business, a brain that automatically helps you find and connect with your audience so you can build your brand and sell more stuff. Activating your MailChimp brain is free and easy. Explore 10 of the most powerful automations that handle the marketing stuff so you can focus on the rest of your business. Then, Sign up for MailChimp. You’re Welcome. Well, that’s it. It’s a pretty comprhensive list, and if you are in small business, you should be using at least 3 of these regularly – if not all 10 – there’s something here for everyone. If I can ever answer any questions about these, feel free to reach out to me. I’m not a professional with any of these by any stretch, but we can find an answer for you. Most all of these have fairly comprehensive knowledge bases on their product websites, or a hotline # we can call. We’ll get you there. It makes sense. Active participation in the recovery process when an employee is injured can make sure that lines of communication are good and that he or she is able to come back to work when able to do so. Our associates at Piedmont Orthopaedic Complex have pioneered a system that promotes direct engagement between the employer and an injured worker via the participation of a certified athletic trainer (ATC). The process is proving to be highly effective at increasing the confidence of injured team members, accelerating the return to work, and reducing risks of claims that wind up in litigation. Typically, a third party administrator (TPA) becomes the main point of contact for an employee who is working through recovery. Because the TPA is basically a claims processor, the level of engagement is low. Employees can easily become frustrated when bureaucratic processes become problematic. Operating within the plant or office environment, the ATC is directly involved when an injury occurs. They can operate proactively if an employee is experiencing pain at work and typically they are the first point of contact when an injury occurs. If a workers’ compensation claim is filed, the ATC becomes an active intermediary, communicating with the employer, the employee, the TPA, and other medical personnel that may be involved. A short “case study” video below will give you some insight to how ATC’s working in an in-plant clinic have impacted employee morale and recoveries at one Georgia employer. If you’d like to learn more about how to structure a comprehensive and scalable plan for a cost-effective workers’ compensation program, you’ll want to attend the upcoming Workers’ Compensation Symposium in Augusta on August 24, 2017. Utilizing a physician’s panel to bring employees back to work quickly. The impact of early intervention to mitigate injuries and accidents. Options for scalable on-site medical care. More information can be found on GEA’s Augusta Workers’ Compensation Symposium page and online registration is available for the event. Is Cyber Liability Insurance the ONLY option for your Business? Cyber issues are in the news a lot today and we are sure everyone is thinking about how it apples to your business or family. As we continue our discussion regarding a new way to think about insurance we thought it would interesting to apply our philosophy to the Cyber Risk issue. Every business is at risk for a cyber breach. Even the White House recently experienced a cyber breach. Cyber breaches are now a fact of life, and every state now has mandatory requirements for data breach notification. Statistics show 39% of all cyber incidents affect businesses with fewer than 100 employees. If you store data, including private information on computers, use e-mail, generate revenue online, or use your computer to control production, manufacturing, or inventory, your company is at risk! While cyber liability insurance should be considered by every business, in addition, we also recommend specific procedures and defensive programs to limit or reduce your risk. Most businesses should consider cyber liability insurance which is designed to cover the costs of investigations, notification, and credit monitoring for affected individuals, regulatory compliance, defending lawsuits, and payment of any resulting judgments or settlements. The level of coverage your business needs is based on your individual operations and can vary depending on your range of exposure.